We started the New Year with a homemade pinata. 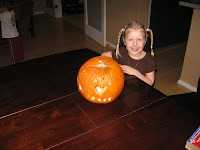 Fun to make, fun to break, fun to eat the goodies inside...and I am pretty sure we were in bed before midnight. Happy St. Patrick's Day! 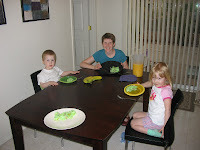 Celebrated at our house with a breakfast of Lucky Charms and a dinner of Green Eggs and Ham! 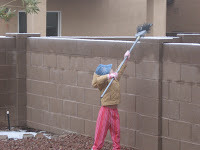 Snow in Tucson! By morning there was so little the kids were left with just a bit to try to scrape off and play with. 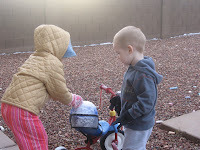 Rhianna came in saying, "Something is wrong with my hands..." Cold Snow - something we aren't used to. 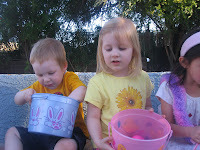 The Easter Egg Hunt with our friends went much better than the one we went to at a big city park. There an air castle collapsed with Rand inside, freaking both Rand and me out. And then kids just stormed the egg field leaving ZERO eggs and crying kids just a minute later by the time we got out there. We will stick to the small, friendly egg hunts from now on. 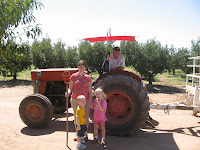 At the end of April, Uncle Calvin (along with Aunt Valerie who stayed for the summer) came to visit. We went mini golfing and just had fun playing before Calvin headed back to Colorado and then off to his mission in San Bernardino, CA. 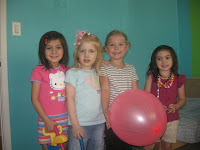 Rhianna took swimming lessons with her friends Amelia and Grace. And Rand took swimming lessons with mom at the YMCA too. Rhianna's 5th birthday with friends, ice cream, and a new house. The house was mom's and dad's birthday present since all of us have June birthdays. We took a big trip up to Idaho and Utah in the summer. 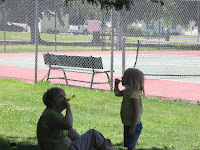 Rhianna and Rand especially liked playing at the different parks and lakes with Grandma and Grandpa. 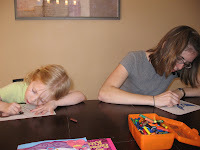 They also loved time with Doug and Marnie and their cousins. 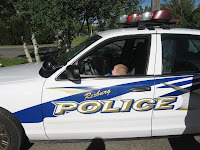 Rand particularly loved the police car and making the lights and sirens go. 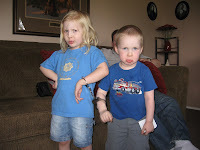 And we had a bit of fun with the kids in cuffs. In Utah we spent most of the time at Bear Lake at a big family reunion. 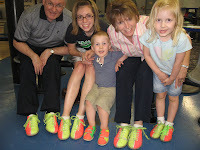 Just before we headed home the kids got to go bowling with Grandma and Grandpa and Valerie - kid bowling shoes are awesome! By the end of the trip Rand was very confused about what Grandma and Grandpa we were talking about and where we were going. 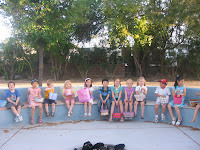 In all, the kids saw both sets of grandparents and two sets of great-grandparents. Wow! We were so lucky to have Valerie with us the whole summer while she did an accounting internship. 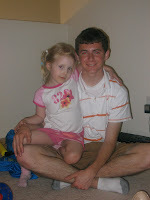 I loved getting so much time to talk with my little sister. 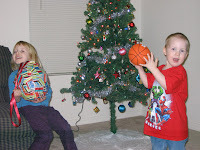 And the kids got lots of play time in too. 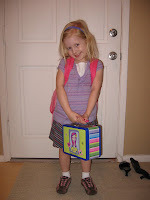 Rhianna started Kindergarten in August and LOVES everything about school. 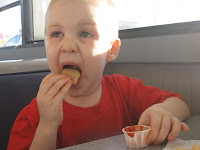 Rand chose to go to Burger King for chicken nuggets for his birthday dinner. 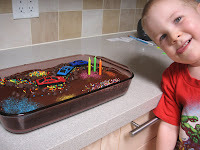 Then we ate his car cake to celebrate his special day. 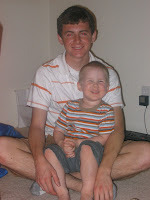 This miniature golf trip was Rand's reward for getting potty trained. 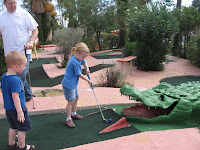 The kids do amazingly well at mini golf. Rand even got a hole in one on the first hole. Rhianna learned about apples in school. 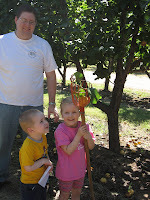 So we took a family field trip to Apple Annie's Orchard. 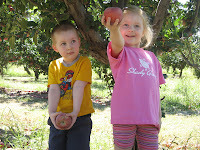 We picked some delicious apples (and peaches and pears). Seth joined our family a few weeks early. He was born on October 25 just after midnight. Grandma got to join us for Halloween since she came to help after Seth was born. 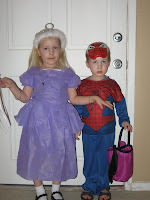 She helped the kids carve 3 faces on their pumpkin and then went out trick-or-treating treating with our purple princess and Spiderman. 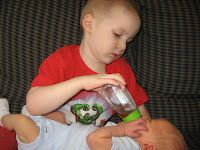 Rand got the honors of helping me feed Seth his first bottle. This is about 1 oz of water mixed with 1 tsp of dark Karo syrup. 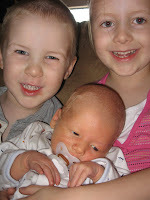 Seth had been fairly healthy, despite both Rhianna and Rand getting croup the night before Seth came home from the hospital. 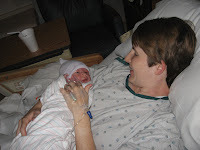 Then he didn't poop for 10 days - a big deal when you are not yet even 30 days old. 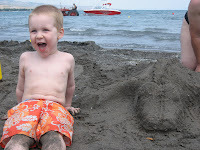 We were certainly glad when he finally did go (so much that we switched diapers in the middle) and are grateful that everything is back to normal now. 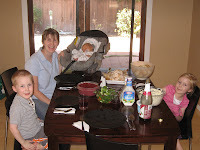 We had Thanksgiving at home with just our little family. Steve did a fantastic job of carving the turkey after watching a professional demonstration. Grandma's cranberry sauce was a hit with the kids and was gone in a few days. 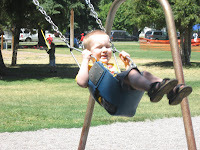 We had great weather and so spent about 4 hours in the afternoon at a park with friends. And now we are counting down the days to Christmas on our chocolate Advent Calendars. We have been so blessed in 2007! Merry Christmas! Rhianna looks so much older to me! But I haven't seen her live and in person in over a year now so I guess that is bound to happen. Rand looks the same, just bigger and Seth just looks new. I am glad to see all the pictures. I wish we were closer to see our kids grow and change. Well, when we get our private jet that will help at least.